The Boston Marathon bombing survivor whose photo of him staggering away from the aftermath of the explosion, with his clothes shredded, became an iconic photo of that tragic day was married to a nurse who helped him recover from his injuries. 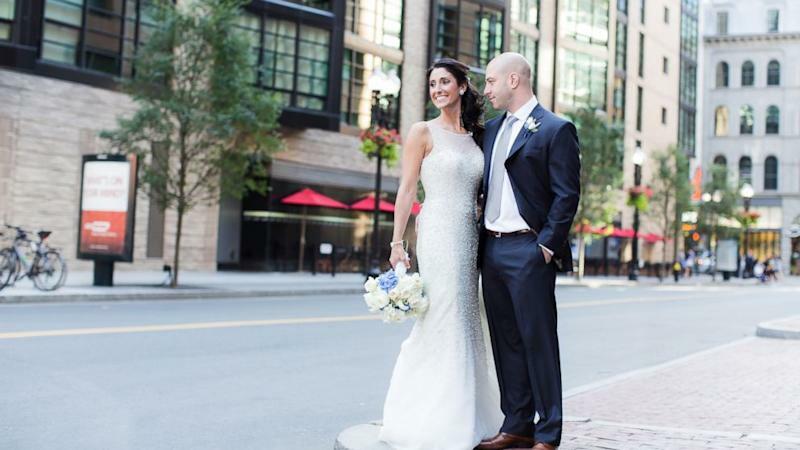 James Costello and nurse Krista D'Agostino tied the knot at Boston's Hyatt Regency on Saturday in an outdoor ceremony before 160 friends and family, a hotel spokeswoman confirmed to ABC News today. The Hyatt, like nearly all the vendors involved in the Costellos’ wedding – from the musicians to the photographer to the honeymoon destination - donated their services to the couple. "It was the most rewarding event I’ve ever been a part of," the couple's wedding planner, Rachael Gross, owner of Lolagrace Events, told ABC News of the Nantucket-themed wedding. "They really love the ocean and the beach and they wanted it to be very classic," she said. "I hit the jackpot with them because they’re really the most wonderful couple." Gross said the wedding reception had a "fun vibe" with "lots of dancing and eating and love," but took a more emotional turn when Costello's brother gave the best man's speech. "James's brother talked about how the bombing made him realize how much he loved and appreciated his brother and does not take him for granted," Gross said. "There was a lot of emotion." Costello spent nearly two weeks in in-patient therapy at the Boston-area Spaulding Rehabilitation Hospital after undergoing multiple surgeries to treat the burns he received when the bombs went off at the marathon’s finish line in April 2013. It was during his stay at Spaulding that Costello met D’Agostino, a traveling nurse whose roughly six-week tour of duty at the hospital coincided with Costello’s stay. The pair fell in love and last December, while on an all-expense paid cruise to Europe sponsored by Vantage Deluxe World Travel for Boston Marathon bombing survivors, Costello proposed. “After sharing a handful of conversations, I realized not only how beautiful she was but also what a kind heart she had. I somehow convinced her to attend a benefit with me, which turned into a few dates, which turned into a few inseparable months,” Costello wrote on his Facebook page, announcing their engagement. Costello was at the Boston Marathon finish line that April day with a group of friends, who included JP and Paul Norden, two brothers who both lost their right legs in the attack. With their wedding services donated, Costello and D’Agostino paid it forward by announcing they would make a donation of their own, including D’Agostino’s wedding gown, to the Semper Fi Foundation. The newlyweds are now honeymooning in Hawaii.